WestHealth of Plymouth, MN has provided convenient outpatient health care services to the Twin Cities since 1994. It offers urgent care, same-day surgery, imaging and lab services, and has more than 50 family and specialty physician clinics. In an effort to communicate with the physicians and their staffs, patients and visitors to the building, WestHealth installed a StrandVision Digital Signage system in the atrium lobby. Now, everyone has the opportunity to catch the news from WestHealth. WestHealth owns a medical professional building in Plymouth, MN that houses about 180 WestHealth employees with approximately 50 medical professional tenants. It recently renovated the building’s main entrance-atrium and included a kiosk to house a digital sign on one side and a touch-screen directory on the other. In this way, WestHealth is able to communicate with the 1,700 to 2,000 physicians, staff and visitors who pass through the atrium each day. WestHealth staff had previously researched digital signage in response to the Director of Surgery’s request to find a timely, efficient way to communicate with his staff who did not use personal computers. At the time, they found StrandVision and decided it would also be an ideal solution for the atrium digital signage project. 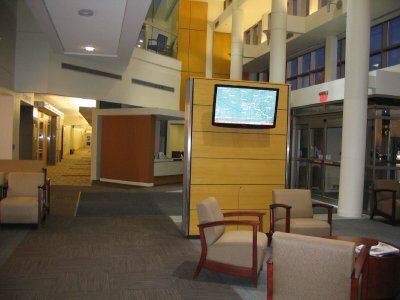 When the atrium renovation was nearing completion, a 42” LCD monitor was mounted in the kiosk. A team from Information Technology and Marketing contacted StrandVision for a demonstration and to discuss their plans. “We saw in the demo that StrandVision would work for us. Joyce [Rubin, Executive Assistant] would be able to easily convert our materials for the sign and the cost was low, so we decided to go for it,” said Cindy Kehus, Information Services Coordinator/Information Security Officer. They selected StrandVision Digital Signage based on the ease of use, low cost, subscription pricing and convenience. StrandVision uses an innovative SaaS (Software as a Service) subscription model that delivers digital signage over the Internet from its servers directly to clients’ digital signage receivers. Subscribers simply log onto the StrandVision Web site. There they can fully manage their digital signage content selecting from StrandVision’s predefined content, upload and schedule pages, and add pictures and graphics. All updates appear on the local screen in a few minutes. Subscribers do not have to make costly investments in onsite equipment (a high-speed Internet connection, personal computer and display monitor is all that’s required), and the annual subscription model is inexpensive and flexible. Now the digital sign is a daily greeter to all of the building’s staff and visitors. The digital sign mix includes WestHealth’s mission statement and values, as well as announcements for community events such as food drives, fund raisers, etc. The signage also carries local weather and maps, and health news that is available on the Internet and streamed by the StrandVision server. Future plans include highlighting specific WestHealth offerings such as flu shots, surgical procedures, the pharmacy and café. The team is also looking into the possibility of additional display screens to better serve their medical tenants.